I was watching Jeff Dean’s keynote presentation for the ACM Symposium on Cloud Computing 2010 (SOCC) that was held yesterday and I found this very interesting bit of information. This is so useful that every Computer Scientist and Engineer should learn it by heart! 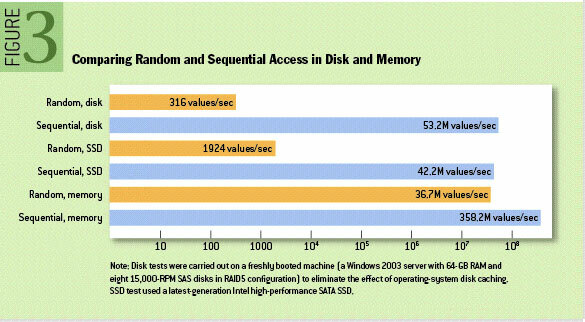 These numbers give you some insight into why random reads from a disk are a really bad idea. This piece information complements the very nice image from Adam Jacobs, and his excellent “The Pathologies of Big Data” article. What should we learn from all this stuff?